For years people have been archiving their lives through photography and videos. These items can be cherished for generations if taken care of properly. We cater to those looking for a professional, unique and visually-appealing means to preserve and present your fondest memories and occasions. 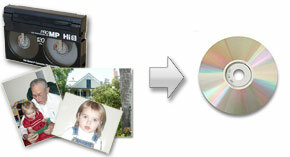 We provide services ranging from photo-CDs and photo editing to home video preservation and photo montages. Finally those home videos on VHS, 8mm or compact-VHS rotting away on the shelf can be given new life with a custom menu and scene selections on DVD. Need a great gift idea for that person who has everything? How about a photo montage of their favorite pictures set to music on a custom DVD? Or that home video of their milestone birthday captured on DVD with a custom menu? The options are endless. Let us help you stop time from aging your most valuable memories.